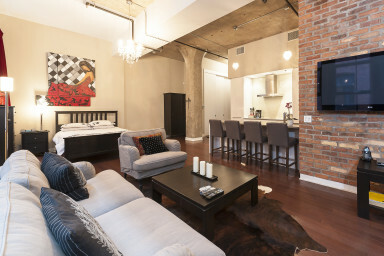 Located in the heart of Downtown Montreal on Saint-Alexandre Street, this 1-bed and 1-bath loft is 700 sq. ft. and features hardwood flooring, factory-style fenestration, 12-foot ceilings, exposed concrete, and brick wall. Amenities include unlimited high-speed Wi-Fi Internet, free local calls and cable television. This magnificent open-concept unit exquisitely showcases a refined industrial aesthetic with all the creature comforts of home. Take advantage of a European-style kitchen, fully equipped with high-end appliances, central island with sitting stools, and complete cookware, to entertain your guests. The fully-furnished living space offers a large den area with plush sofas and wall-mounted flatscreen TV perfect for relaxing, and you’re sure to get plenty of rest thanks to a comfy queen-size bed. A designer bathroom features Zen sink, glass-paneled walk-in shower, and luxury finish. Unit #388 also comes ready with high-quality linen and concealed washer/dryer for your convenience. Enjoy a stylish stay in the city with Simplissimmo! Originally built in 1911 to house the Gillette Safety Razor Company, the 6-storey Gillette Lofts has been beautifully restored and recently converted by world-renowned architect Karl Fischer. Guests staying here benefit from concrete soundproofing, central air-conditioning, a furnished lobby entrance, and 24-hour video surveillance. Fast-paced and always exciting, the International District is without a doubt one of Montreal’s most vibrant neighborhoods. Located in close proximity to several landmarks such as Saint Patrick’s Basilica and Victoria Square, this address allows you to soak up the historic and cultural vibe of the city all while marveling at its many impressive skyscrapers. Within walking distance, access to an unparalleled amount of concerts and activities that regularly take place at the lively Quartier des Spectacles, as well as find the colorful Palais des Congrès, an international hub for a variety of conventions and conferences, nearby. Satisfying all your shopping needs couldn’t be easier thanks to Sainte-Catherine Street’s endless selection of name-brand retailers and boutiques just minutes away, and for its iconic architecture and 46th floor observatory restaurant, a visit to Place Ville-Marie is an absolute must. End your day on a high note by relishing in any one of the area’s numerous fine-dining options such as Normand Laprises’s celebrated Toqué, local seafood haven Notkins, or critical darling Jatoba by Chef Antonio Park. The best the city has to offer is found in Downtown Montreal!